Prophet Walter Magaya (file photo). Zimbabwe Divine Destiny leader, Bishop Ancelimo Magaya has urged President Emmerson Mnangagwa to pay attention to the people's struggles or risk facing the wrath of God. "It is not the will of God that Zimbabweans suffer this much in a land with natural resources... We have started to witness a new wave in price increases of every commodity including basics such as bread, mealie-meal, cooking oil etc. "How do you expect families to survive? 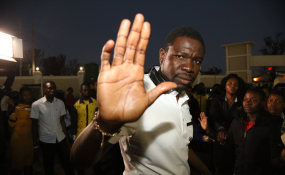 First, you outprice other motorists by making it unaffordable, you now want to outprice people from their basic food," said Magaya. He said the church will not keep quiet over "such inhumane and ungodly behavior by leadership that purport to identify with the suffering masses, except in lip service." Since assuming office, Mnangagwa's administration has been plagued by a number of challenges ranging from doctors' strike, inflation, cash and fuel shortages, drug shortages, to name but a few. This has further dented Mnangagwa's re-engagement ambitions with Britain recently announcing that it is mulling imposing more sanctions on the troubled country's leaders.